Crafting With Craig: "Its the most wonderful time of the year" Tattered Lace Double card. "Its the most wonderful time of the year" Tattered Lace Double card. Afternoon, Well what a sunny afternoon it has turned out to be. Just out from a lovely walk along the beach with the dog. Its a bit chilly at first but once being out in the sun for a while its really lovely. Well i'm truly in the middle of christmas card making now, its always strange making christmas cards when the sun is out and its warm in the summer time. its a brill feeling this time of year making christmas cards while the sun is out but there's a chill in the air. just makes it feel even more christmassy. Why not have a bit of christmas music on in the background.....i do haha. One that i have made is using this die from Tattered Lace that i bought last week on Create and Craft. It arrived on Monday and i just had to play instantly with it. Its called "The most wonderful time of the year" die. its so detailed and elegant and although this a 8x8 card, im so tempted to make this my own personal card for friends and family, but making it a 7x7 card size. 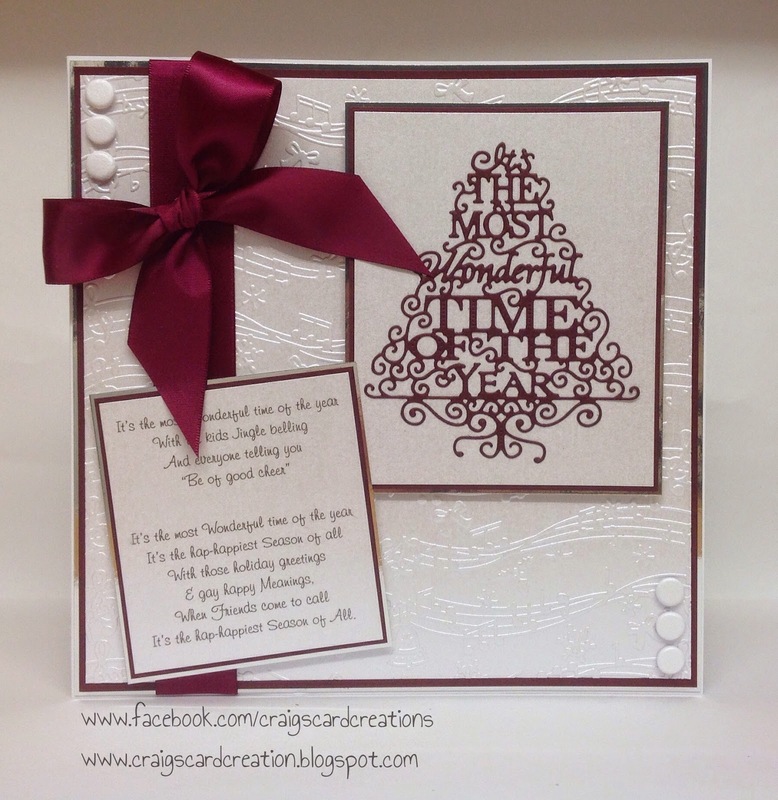 as it says the title of the famous christmas song, i just had to add a couple of versus of the song, it just makes it more fun and compliment it all, i embossed the background card using a music not embossing folder. Used some wine coloured textured card stock and silver mirri card, satin ribbon and bang, the card is complete. 2mm A4 foam pad sheet - S5718. PVA glue and metal tip - S56890. "Handmade by" labels - S57261. "The most wonderful time of the year" Die - Tattered Lace. Silver shimmer Centura pearl card - Crafters Companion. Music note embossing folder - Embossolicious Crafters Companion. Wine coloured textured card stock - Bazzill Basics. 25mm Wine coloured Satin ribbon - American Crafts. Ice white card candi - Craftwork Cards. This 7x7 card has been made using all the same Stix2 products (as above) except from the glue gun and glue sticks. Brown & ivory textured card stock - Bazzill Basics. Holly leaves & berries 6x6 background paper - Trimcrafts (Dovecrafts) Traditional paper pad. 7x7 card blank - Craftwork Card. 15mm Brown satin ribbon - American Craft. 10mm Red organza ribbon - American Crafts. PLEASE REMEMBER - If you have any questions or quires regarding any Stix2 products please feel free to contact Stix2 on the details below, the girls will be more than happy to help and guide you with any problems, issues or questions. There is never ever a silly questions. If i can help, i will do my best to help and answer your questions, if i dont have the answers or are unsure, i will forward your question onto the girls for you.